Spinach, Water, Tomatoes, Paneer Chesse, Onions, Sunflower Oil, Garlic, Salt, Ginger, Chilies, Cumin. 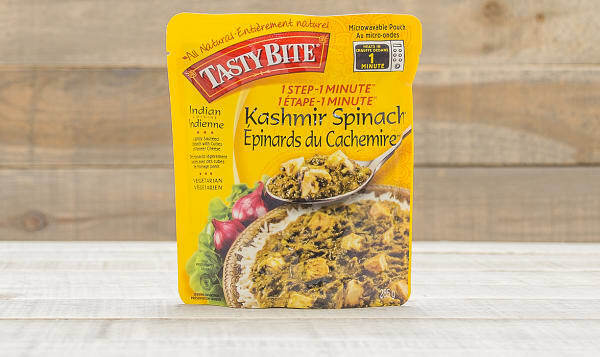 Like the silk that the region is known for, Tasty Bite's Kashmir Spinach is smooth and luxurious in both texture and flavor. They carefully sauté our freshly harvested spinach in a light curry sauce with cubes of creamy paneer cheese. Best served over a generous portion of your favorite rice.